The Fellowship was fortunate enough to obtain a copy of BLOODSHOT #5 from Valiant Entertainment. Duane Swierczynski writes, and Manuel Garcia and Arturo Lozzi draw. Bloodshot is ready now. He’s escaped from Project Rising Spirit. He’s found an ally in Emmanuel Kuretich, and two more in Kara and Pulse. And his nanites have got him in tip-top shape, healed up and ready to go. Now it’s time to attack and destroy the PRS facility. But they’re going to be well defended and ready for him. It’s fun to come back now at the start of a new arc and see Ray now that he’s getting it together. He’s got a handle on who he is now, and he has a feel for what he can do. He’s still a bit distant, but at least he has some friends, right? The end of this issue sets up the beginning of what looks to be a fun fight, too. And they added a teaser page at the end with some interesting implications. This is still a really cool book, and it looks like they’re planning to keep it that way for a good while to come. The Valiant guys are really taking it to the next level this time. 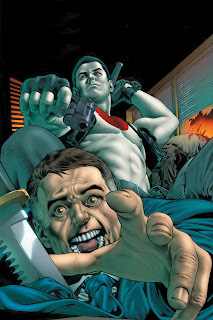 BLOODSHOT #5 is available now at your FLCS or by order from valiantuniverse.com.